Introduction § Starting—and then sticking with—an exercise program is a significant challenge. § There is a difference in motivation between starting and adhering to a program. 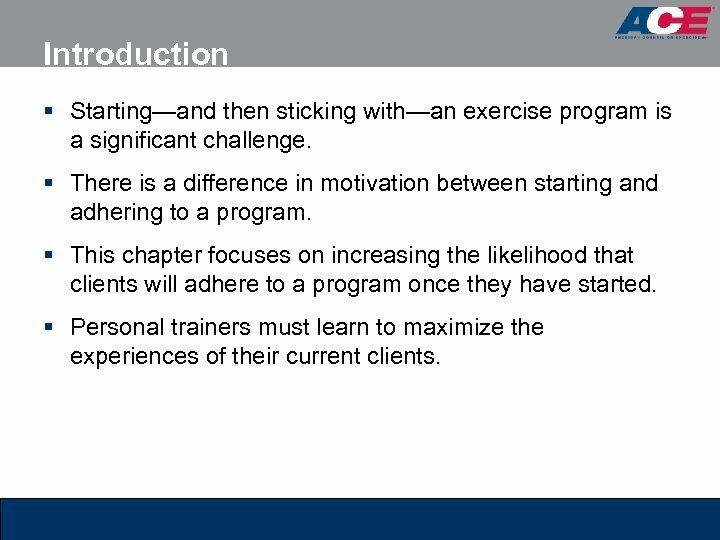 § This chapter focuses on increasing the likelihood that clients will adhere to a program once they have started. 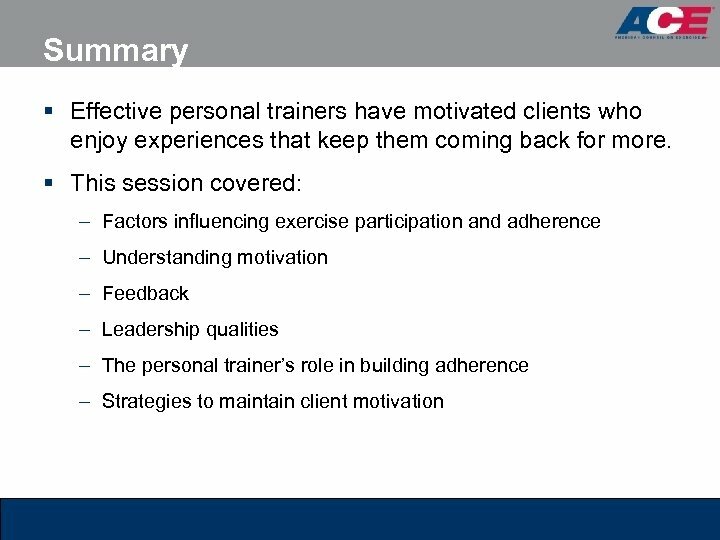 § Personal trainers must learn to maximize the experiences of their current clients. 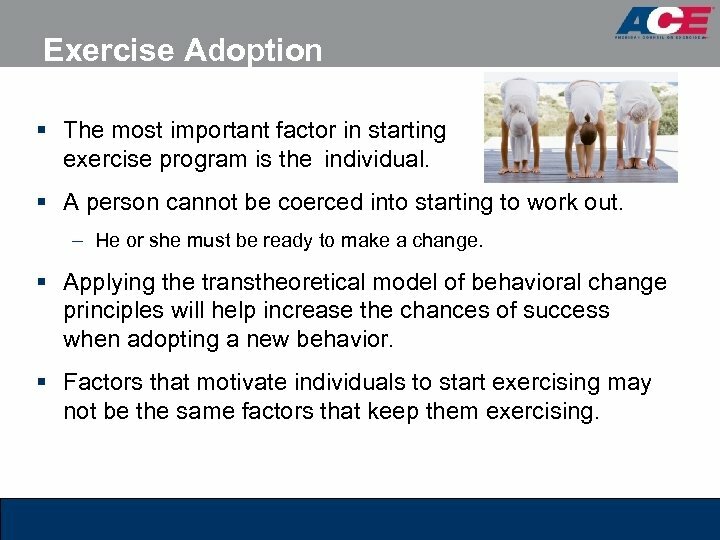 Exercise Adoption § The most important factor in starting exercise program is the individual. an § A person cannot be coerced into starting to work out. – He or she must be ready to make a change. § Applying the transtheoretical model of behavioral change principles will help increase the chances of success when adopting a new behavior. § Factors that motivate individuals to start exercising may not be the same factors that keep them exercising. 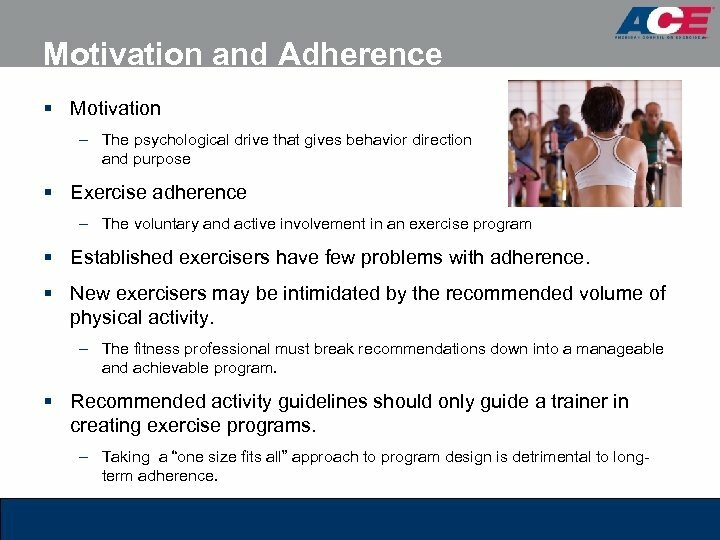 Motivation and Adherence § Motivation – The psychological drive that gives behavior direction and purpose § Exercise adherence – The voluntary and active involvement in an exercise program § Established exercisers have few problems with adherence. § New exercisers may be intimidated by the recommended volume of physical activity. – The fitness professional must break recommendations down into a manageable and achievable program. 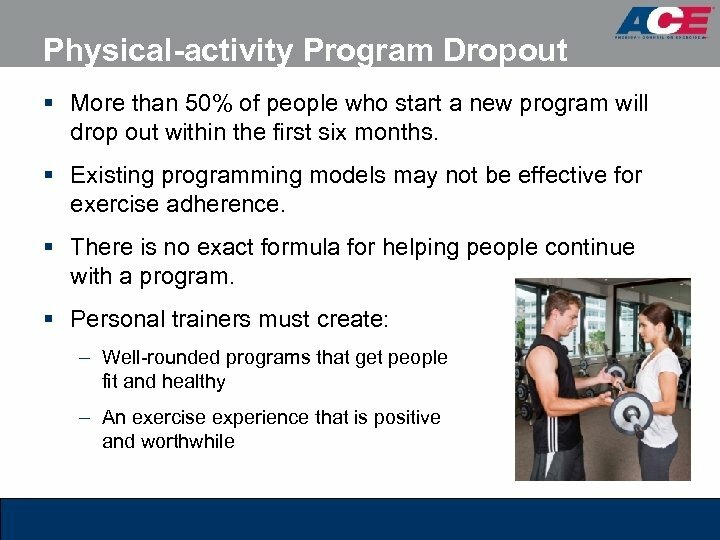 § Recommended activity guidelines should only guide a trainer in creating exercise programs. 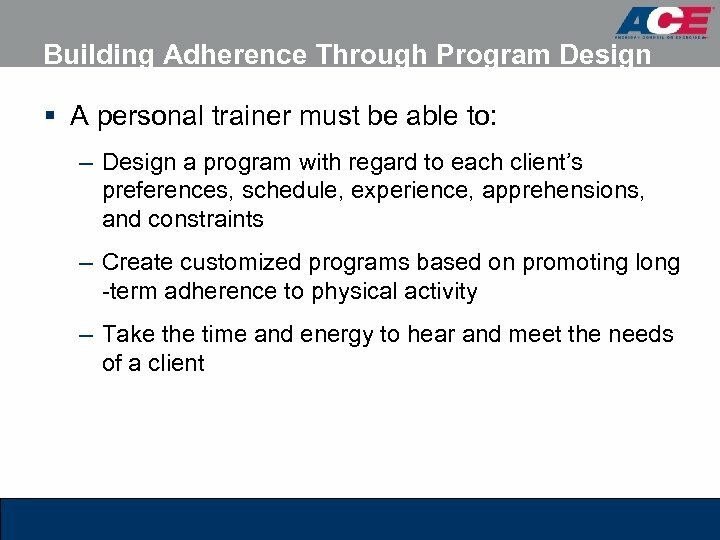 – Taking a “one size fits all” approach to program design is detrimental to longterm adherence. 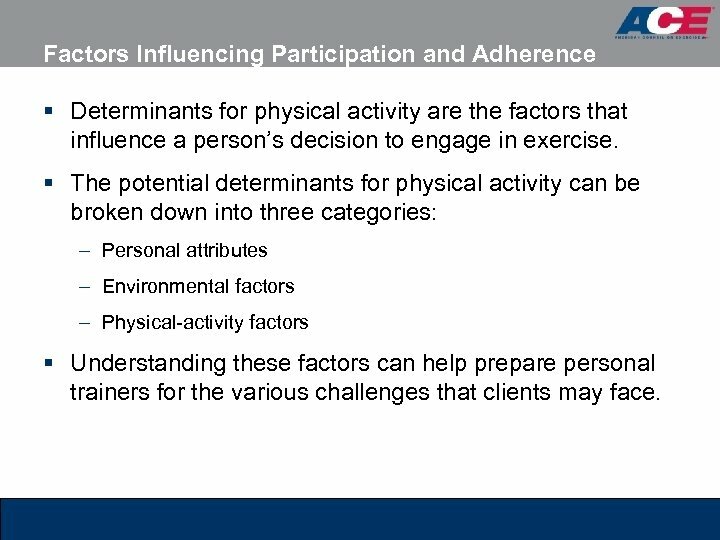 Factors Influencing Participation and Adherence § Determinants for physical activity are the factors that influence a person’s decision to engage in exercise. 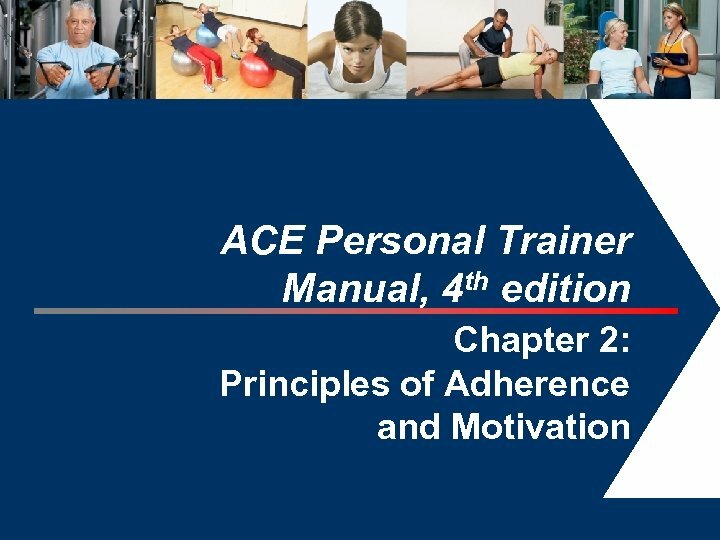 § The potential determinants for physical activity can be broken down into three categories: – Personal attributes – Environmental factors – Physical-activity factors § Understanding these factors can help prepare personal trainers for the various challenges that clients may face. 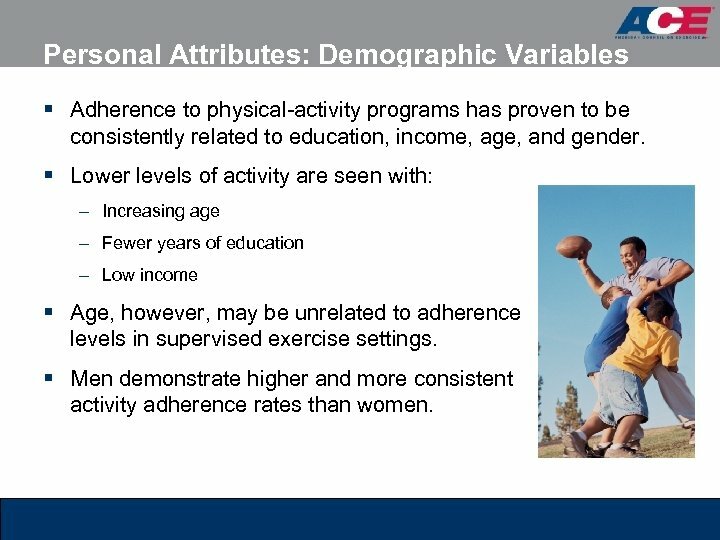 Personal Attributes: Demographic Variables § Adherence to physical-activity programs has proven to be consistently related to education, income, age, and gender. § Lower levels of activity are seen with: – Increasing age – Fewer years of education – Low income § Age, however, may be unrelated to adherence levels in supervised exercise settings. § Men demonstrate higher and more consistent activity adherence rates than women. 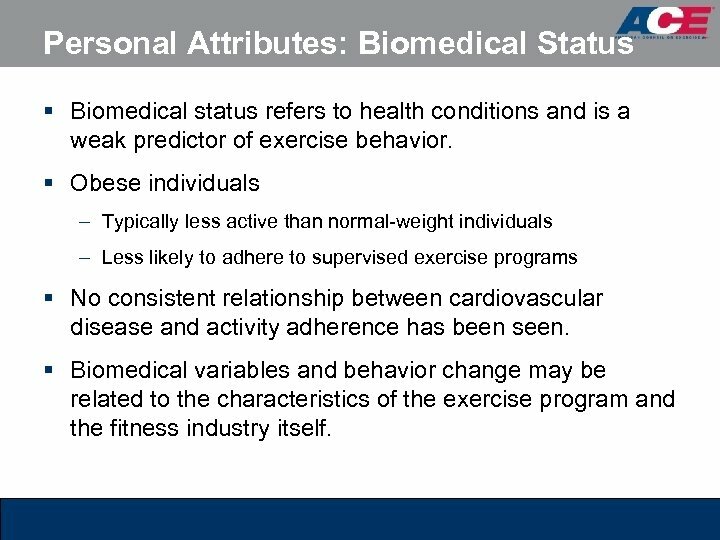 Personal Attributes: Biomedical Status § Biomedical status refers to health conditions and is a weak predictor of exercise behavior. § Obese individuals – Typically less active than normal-weight individuals – Less likely to adhere to supervised exercise programs § No consistent relationship between cardiovascular disease and activity adherence has been seen. § Biomedical variables and behavior change may be related to the characteristics of the exercise program and the fitness industry itself. 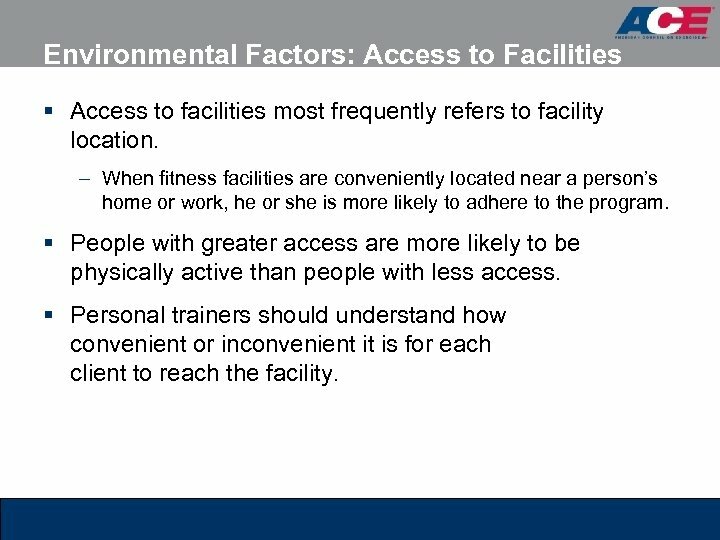 Environmental Factors: Access to Facilities § Access to facilities most frequently refers to facility location. – When fitness facilities are conveniently located near a person’s home or work, he or she is more likely to adhere to the program. 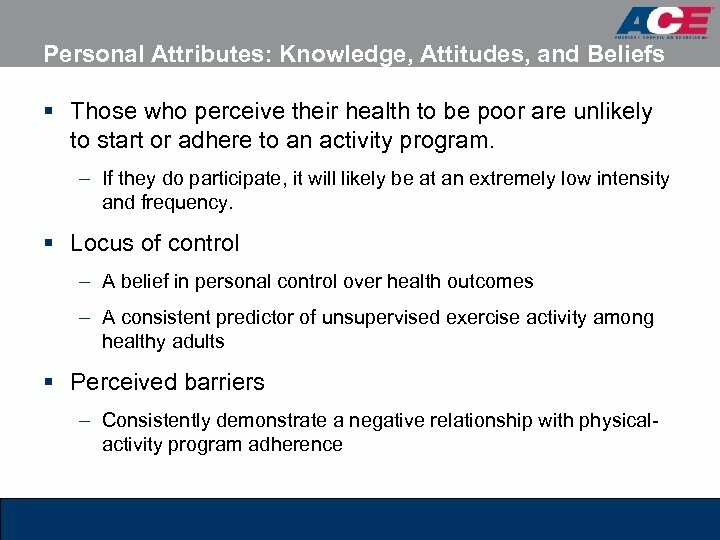 § People with greater access are more likely to be physically active than people with less access. § Personal trainers should understand how convenient or inconvenient it is for each client to reach the facility. 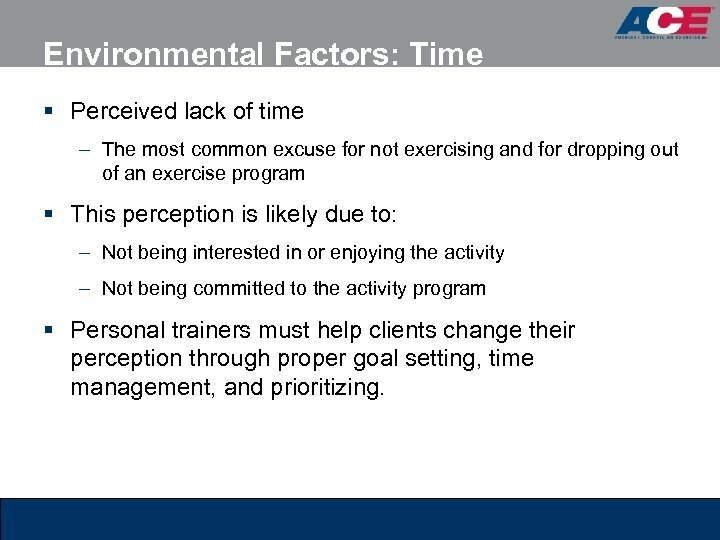 Environmental Factors: Time § Perceived lack of time – The most common excuse for not exercising and for dropping out of an exercise program § This perception is likely due to: – Not being interested in or enjoying the activity – Not being committed to the activity program § Personal trainers must help clients change their perception through proper goal setting, time management, and prioritizing. 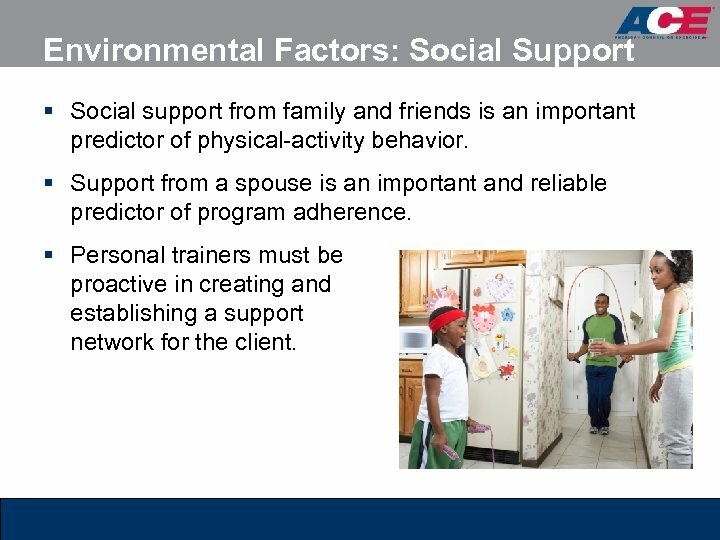 Environmental Factors: Social Support § Social support from family and friends is an important predictor of physical-activity behavior. 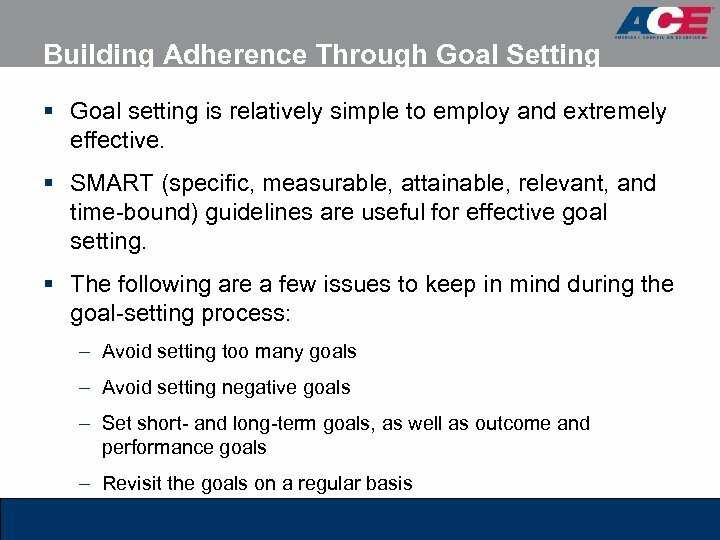 § Support from a spouse is an important and reliable predictor of program adherence. 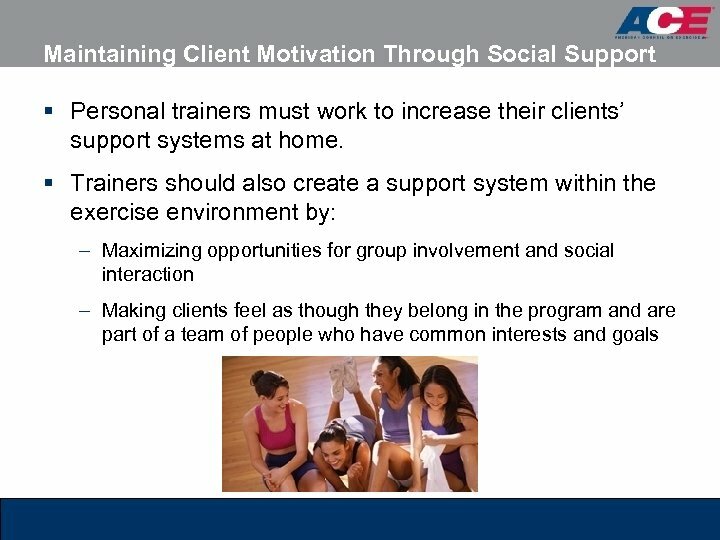 § Personal trainers must be proactive in creating and establishing a support network for the client. 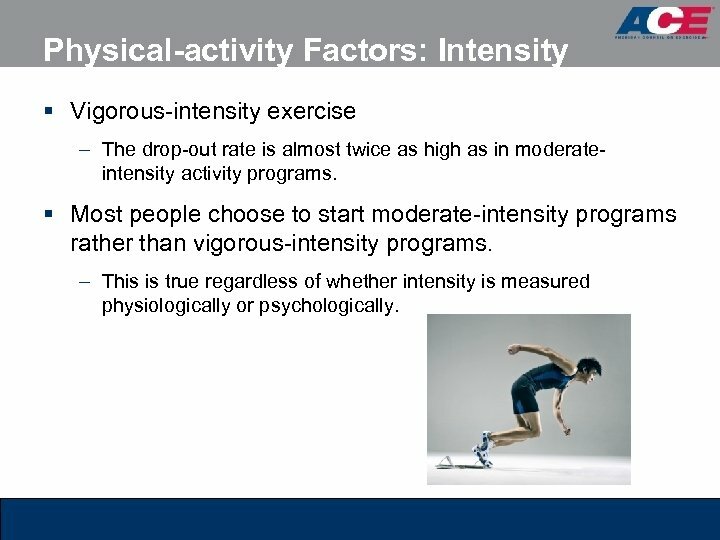 Physical-activity Factors: Intensity § Vigorous-intensity exercise – The drop-out rate is almost twice as high as in moderateintensity activity programs. 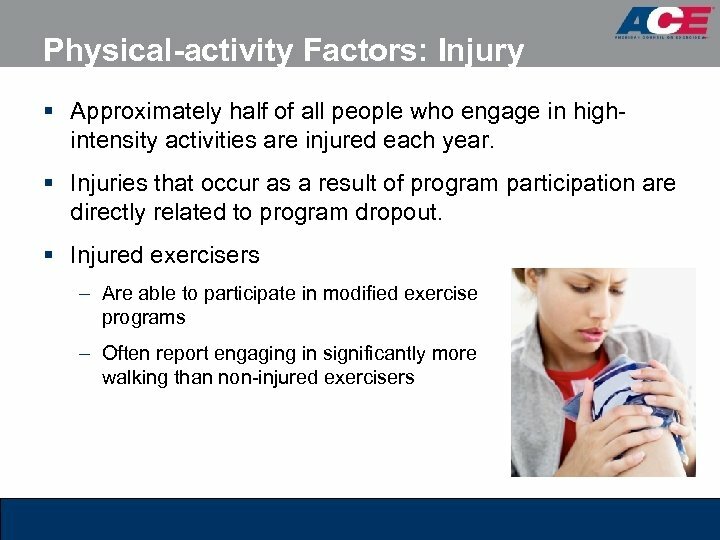 § Most people choose to start moderate-intensity programs rather than vigorous-intensity programs. – This is true regardless of whether intensity is measured physiologically or psychologically. 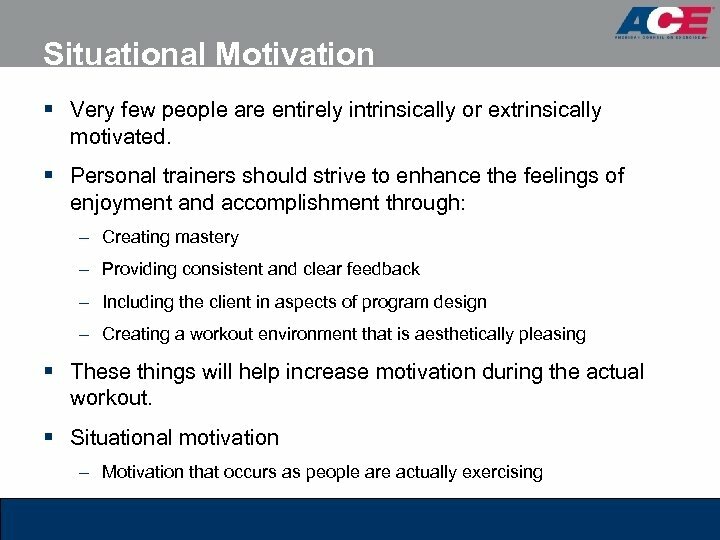 Understanding Motivation § Motivation can come from: – Within a person and is sometimes described as a personality trait – Other people’s encouragement, guidance, and support – Things, ideas, and events § A person beginning an exercise program must buy into the process and into the motivators. 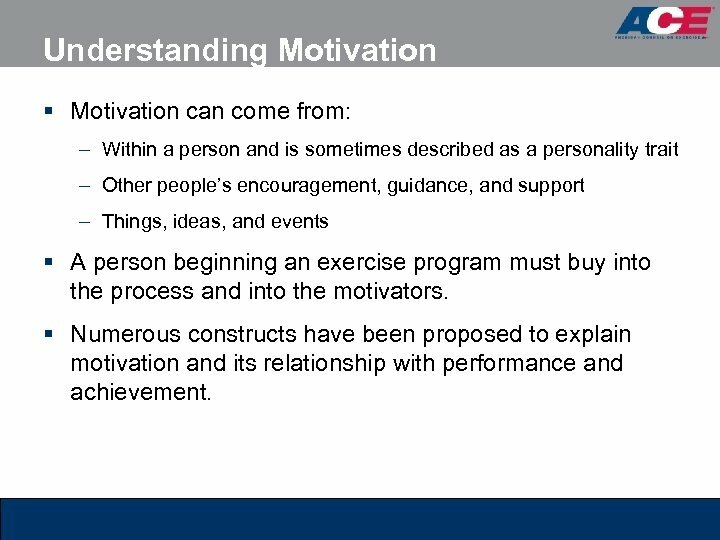 § Numerous constructs have been proposed to explain motivation and its relationship with performance and achievement. 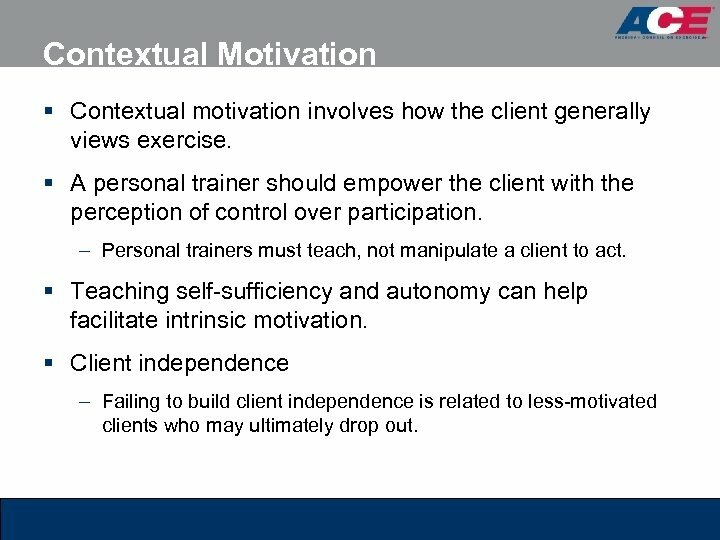 Contextual Motivation § Contextual motivation involves how the client generally views exercise. 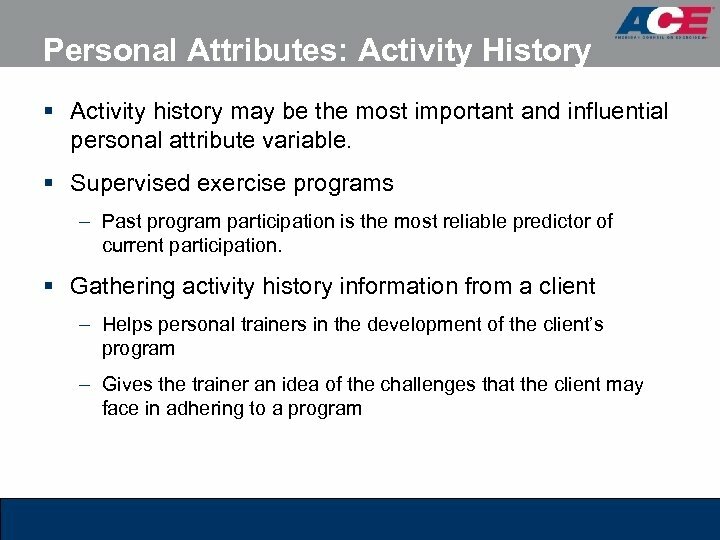 § A personal trainer should empower the client with the perception of control over participation. 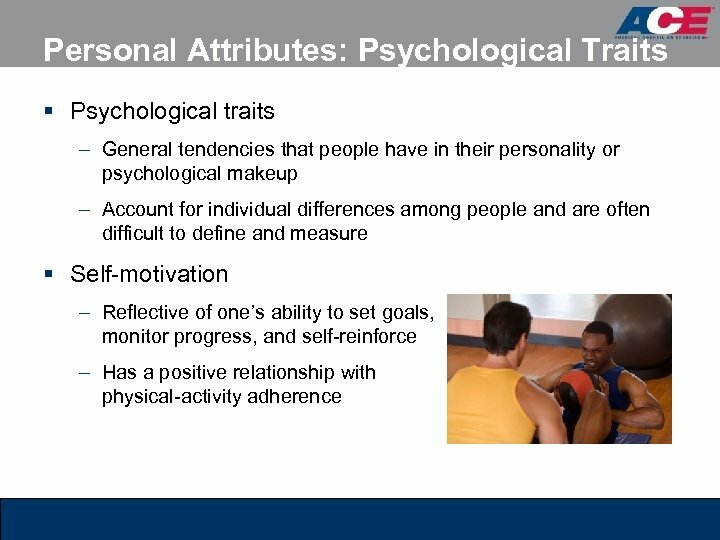 – Personal trainers must teach, not manipulate a client to act. 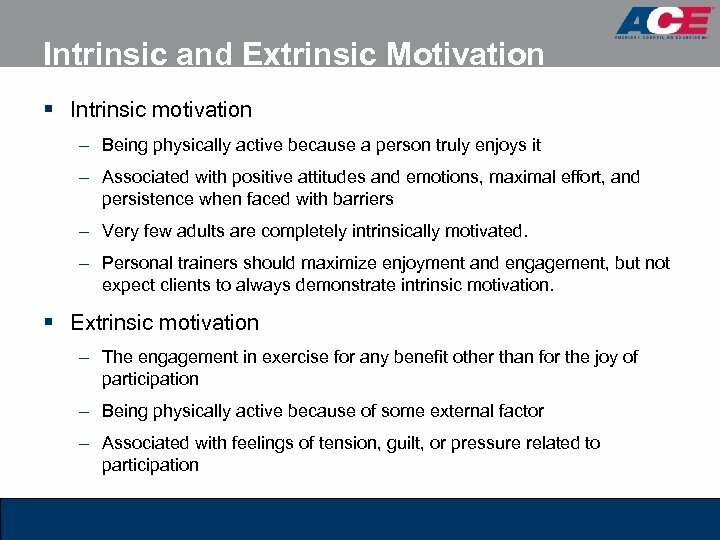 § Teaching self-sufficiency and autonomy can help facilitate intrinsic motivation. § Client independence – Failing to build client independence is related to less-motivated clients who may ultimately drop out. 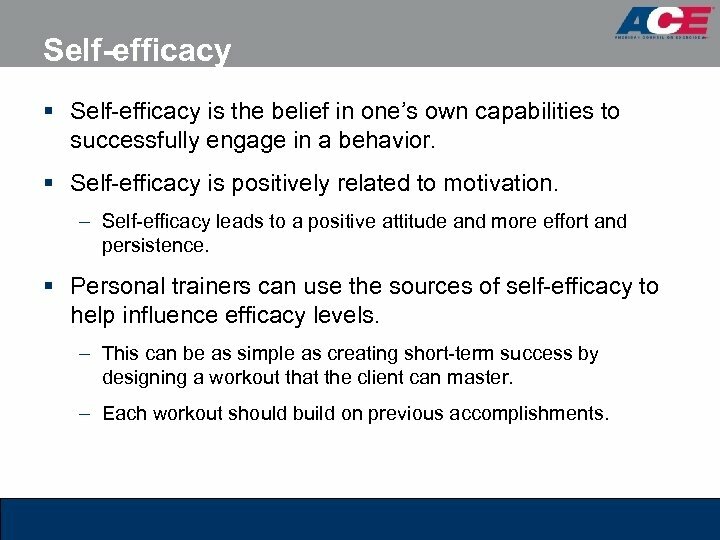 Self-efficacy § Self-efficacy is the belief in one’s own capabilities to successfully engage in a behavior. § Self-efficacy is positively related to motivation. – Self-efficacy leads to a positive attitude and more effort and persistence. 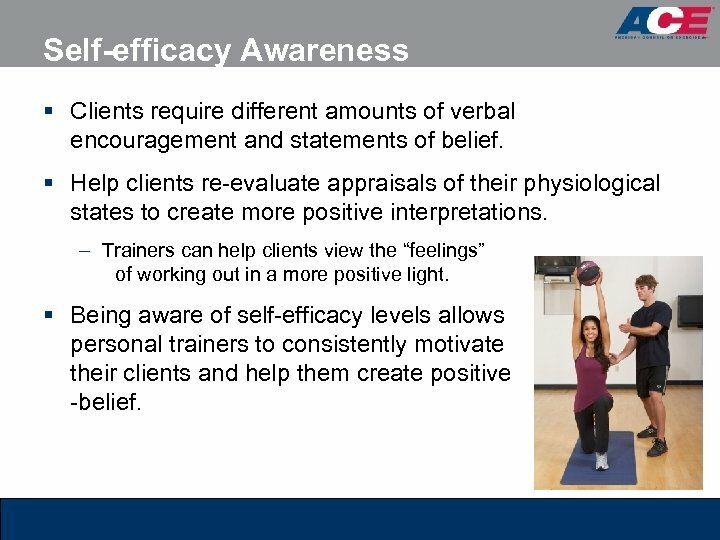 § Personal trainers can use the sources of self-efficacy to help influence efficacy levels. – This can be as simple as creating short-term success by designing a workout that the client can master. – Each workout should build on previous accomplishments. Feedback § Feedback can be either intrinsic or extrinsic. 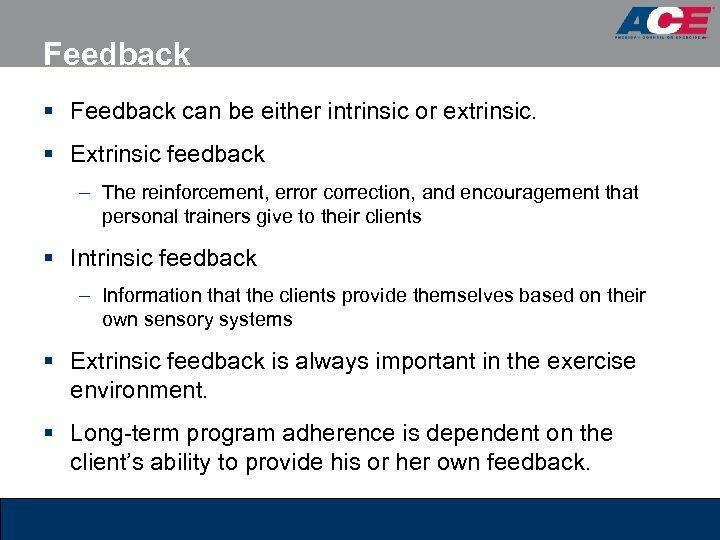 § Extrinsic feedback – The reinforcement, error correction, and encouragement that personal trainers give to their clients § Intrinsic feedback – Information that the clients provide themselves based on their own sensory systems § Extrinsic feedback is always important in the exercise environment. 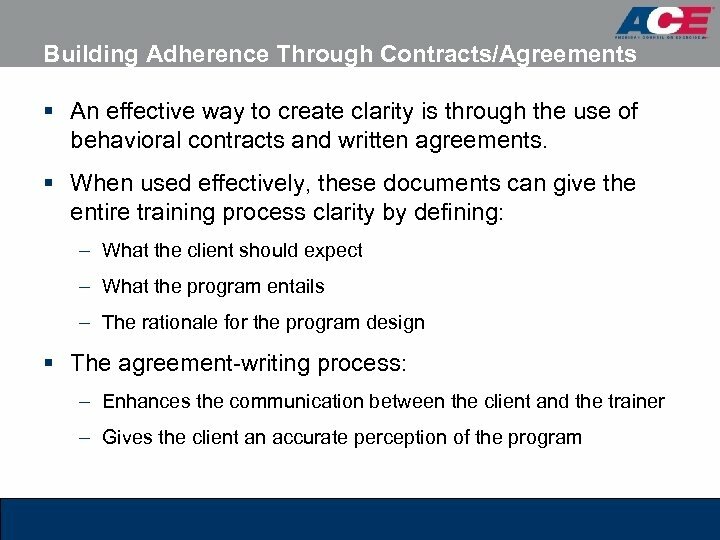 § Long-term program adherence is dependent on the client’s ability to provide his or her own feedback. 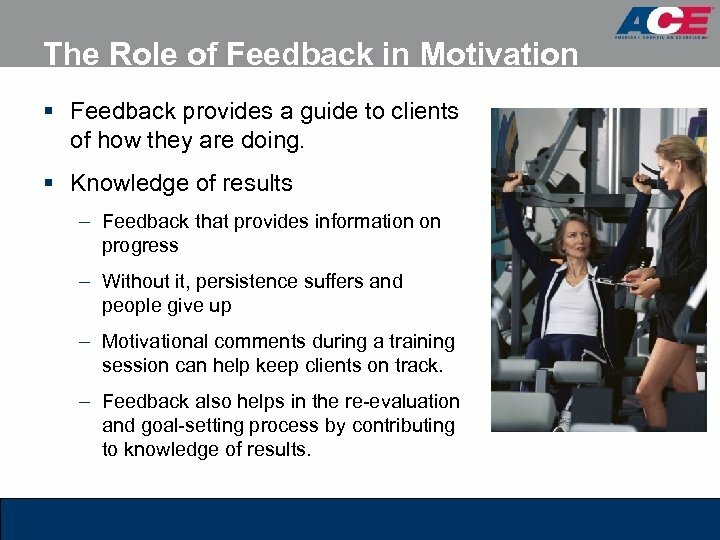 The Role of Feedback in Motivation § Feedback provides a guide to clients of how they are doing. § Knowledge of results – Feedback that provides information on progress – Without it, persistence suffers and people give up – Motivational comments during a training session can help keep clients on track. – Feedback also helps in the re-evaluation and goal-setting process by contributing to knowledge of results. 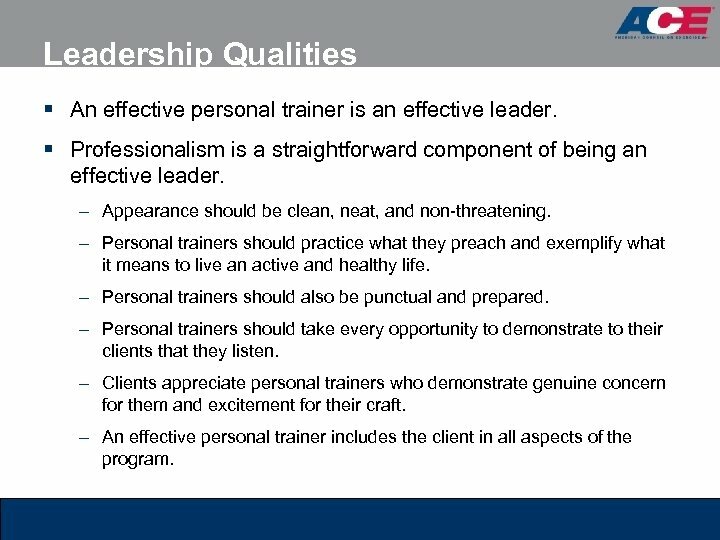 Leadership Qualities § An effective personal trainer is an effective leader. § Professionalism is a straightforward component of being an effective leader. – Appearance should be clean, neat, and non-threatening. – Personal trainers should practice what they preach and exemplify what it means to live an active and healthy life. – Personal trainers should also be punctual and prepared. – Personal trainers should take every opportunity to demonstrate to their clients that they listen. – Clients appreciate personal trainers who demonstrate genuine concern for them and excitement for their craft. – An effective personal trainer includes the client in all aspects of the program. 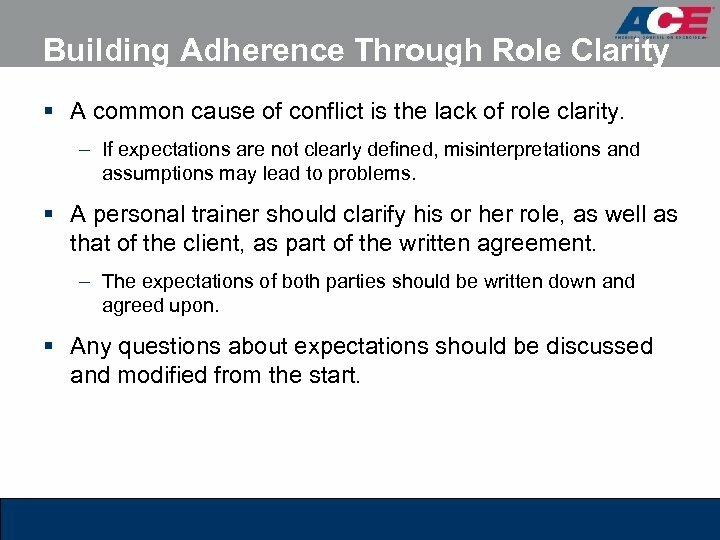 Building Adherence Through Role Clarity § A common cause of conflict is the lack of role clarity. – If expectations are not clearly defined, misinterpretations and assumptions may lead to problems. 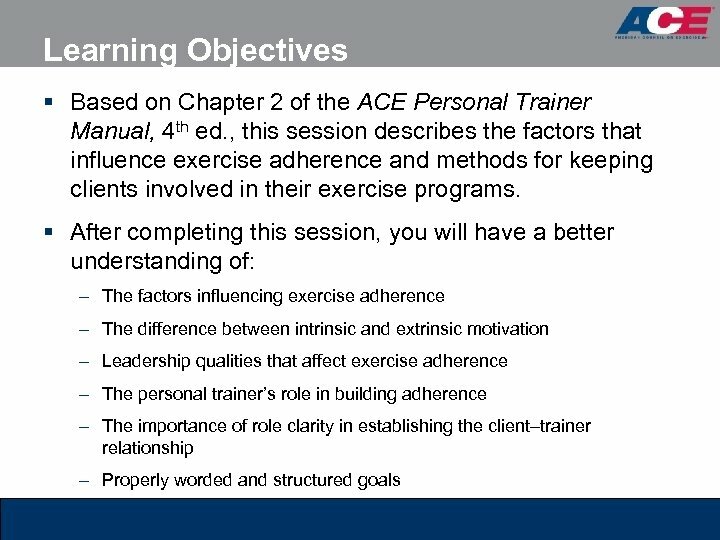 § A personal trainer should clarify his or her role, as well as that of the client, as part of the written agreement. – The expectations of both parties should be written down and agreed upon. § Any questions about expectations should be discussed and modified from the start. 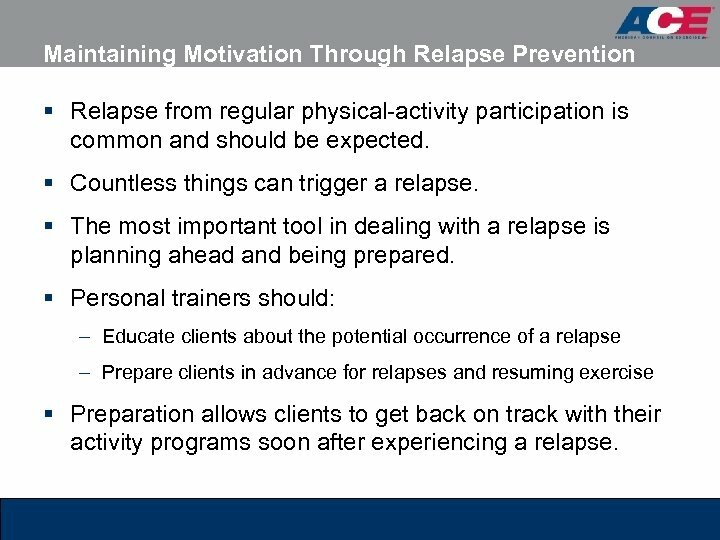 Maintaining Motivation Through Relapse Prevention § Relapse from regular physical-activity participation is common and should be expected. § Countless things can trigger a relapse. § The most important tool in dealing with a relapse is planning ahead and being prepared. 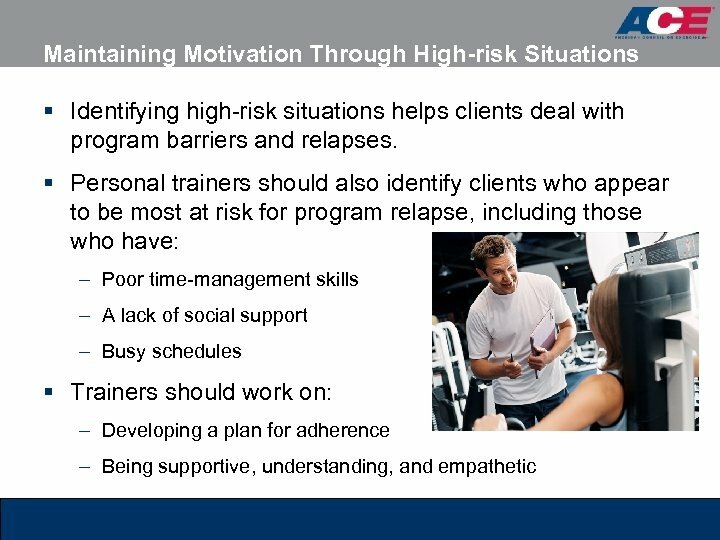 § Personal trainers should: – Educate clients about the potential occurrence of a relapse – Prepare clients in advance for relapses and resuming exercise § Preparation allows clients to get back on track with their activity programs soon after experiencing a relapse. 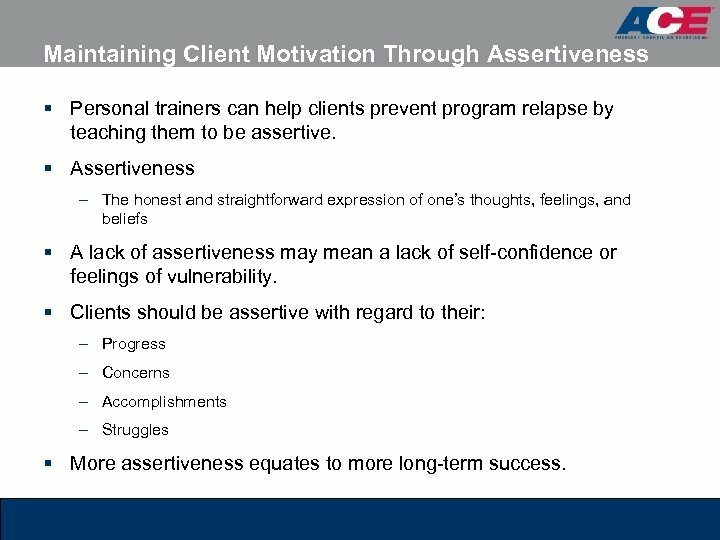 Maintaining Client Motivation Through Assertiveness § Personal trainers can help clients prevent program relapse by teaching them to be assertive. § Assertiveness – The honest and straightforward expression of one’s thoughts, feelings, and beliefs § A lack of assertiveness may mean a lack of self-confidence or feelings of vulnerability. § Clients should be assertive with regard to their: – Progress – Concerns – Accomplishments – Struggles § More assertiveness equates to more long-term success. 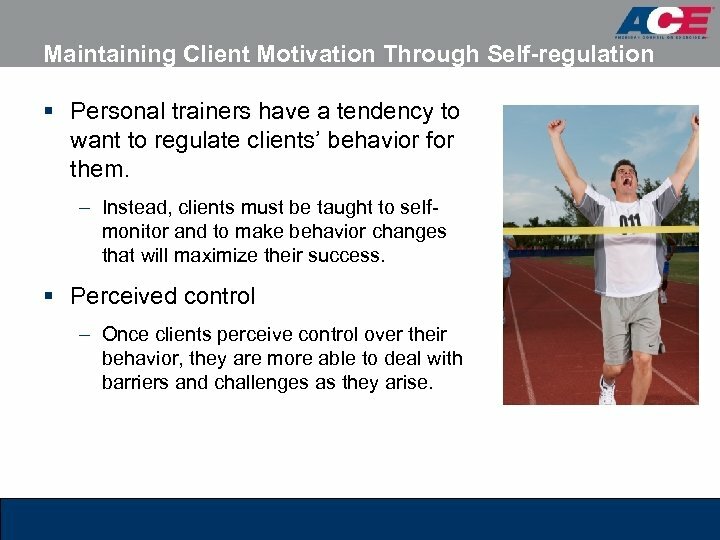 Maintaining Client Motivation Through Self-regulation § Personal trainers have a tendency to want to regulate clients’ behavior for them. – Instead, clients must be taught to selfmonitor and to make behavior changes that will maximize their success. § Perceived control – Once clients perceive control over their behavior, they are more able to deal with barriers and challenges as they arise.